One of my favourite shots in table tennis is the block. In many ways, it’s a very simple shot. Little physical effort is required, you just need to get your body and bat in the right position and work with the speed and spin already on the ball. The other player does all the hard work, whilst you use all their speed and spin against them, putting them under lots of pressure to keep the rally going. (For a brief tutorial on how to play a block, watch this video created by the ITTF). It’s a shot I practice a lot, mainly because when coaching I regularly take on the role of feeder to develop a player’s attacking game. They topspin, I block. As a result, I’m very comfortable blocking and it’s a shot I’ll often use in competitive matches, most of the time successfully. But I get the feeling many players don’t value the block, so don’t spend much time practising. Certainly with the players I coach, it’s rarely on the top of the list of things that they want to improve. Maybe this is because the modern table tennis style is all about topspin attacks, counter topspin attacks and looping back from the table. The good, old, humble block has been relegated in its importance. I think this is a real shame. Blocking can add more variety to your game, allowing you to defend close to the table, disrupt the rhythm of your opponent and give you a very useful weapon to compete with attacking topspin players. And the block is not only for defence. If used aggressively, you can hit clean winners with minimal effort (more on this later). If you don’t block or have never learnt to block, this is what you should start with first. It’s quite easy as you really don’t have to do a lot. When your opponent plays a topspin shot, stay close to the table, get your body in the right position (backhand block in front of your body, forehand block to the side of your body), and adjust your bat angle depending how much spin is on the ball (more spin = close bat angle more). Your stroke should be very short. If there is a lot of speed on the ball, you may not need to play much of a stroke at all. When player’s first learn the steady block, they often try to hit the ball too much. You don’t have to. Keep it simple. Use the speed which is already on the ball. Just think of yourself as a brick wall! Vladimir Samsanov plays this type of block very well. 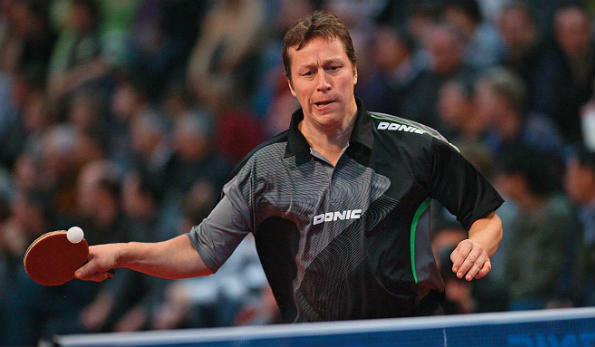 He makes playing table tennis look effortless. He will often block two, three, four times, forcing his opponent to play a weaker attack and then he will go on the counter attack. When you are confident playing a steady block, you should try and develop an aggressive block. You could even consider this more of an attacking stroke (or at the very least an assertive defensive stroke), as you’re blocking back with a lot of speed in an attempt to force an error from your opponent or even hit a clean winner if your opponent is off the table. The key here is to block with more forward movement with your stroke. Your aim is to return the ball to your opponent with speed. If you rush your opponent it is much harder for them to continue to attack. The aggressive block is more difficult to do, because you have to stay close to the table, react very quickly and play a longer stroke. This can be difficult to do against a fast attacker who is capable of playing topspin shots to different positions. But against a slower attacker or a predictable fast attacker (someone who always attacks to the same spot), it’s easier to do. Stefan Fegerl plays an aggressive block very well. Blocking as a playing style isn’t very common in the professional game anymore, but Fegerl shows you can still reach a very high level by blocking a lot. Take a look at this match between Fegerl and Fan Zhendong in the final of the 2015 Polish Open. By staying close to the table and blocking aggressively, Fegerl takes time away from Fan Zhendong, puts him under a lot of pressure, forces errors and nearly causes a major upset. When you have mastered the steady block and the aggressive block, you could also try and develop trick blocks, such as a chop-block or a side-spin block. A chop-block is where you brush down on the ball on contact. This adds backspin to the ball, which can really throw your opponent. The ball slows down, and of course the spin is not what they are expecting. The surprise factor alone can win you a cheap point. A word of warning. This is not an easy shot to master. Don’t attempt to use it in competitive matches unless you have practiced it a lot. Here’s a video of Ma Long playing a chop block. A side-spin block, is also tricky to master, but can also confuse your opponent. Here you need to move your bat left to right (or right to left) whilst blocking the ball. The aim is to make the ball jump left or right when it bounces on your opponent’s half of the table. This extra movement can force your opponent to stretch for the next ball, making it harder to play a strong attack. Here’s a video of Kenta Matsudaira playing his famous side-spin block. There’s a lot of different ways you can use a block. You can use a block to defend. You can use a block to attack. You can use a block to bamboozle your opponent. A good block is a useful addition to anyone’s game. If it’s not something you practice, you should.